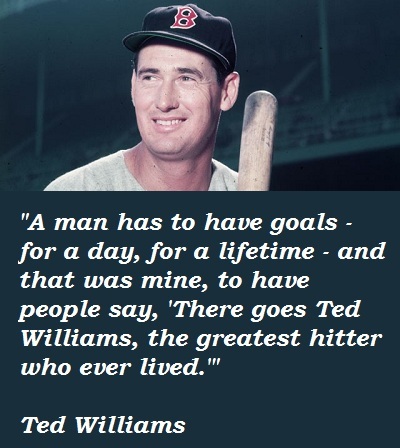 Over the weekend, which happened to include Father’s Day, I listened to an interview that focused on a book written about Ted Williams. The book, written by Williams’ daughter, looks at one of the greatest hitters who ever played the game of baseball, and highlights some of the lessons this daughter learned from her father. •	Romans 5:1-5: Since we have been declared righteous by faith, we have peace with God through our Lord Jesus Christ. We have also obtained access through Him by faith into this grace in which we stand, and we rejoice in the hope of the glory of God. And not only that, but we also rejoice in our afflictions, because we know that affliction produces patient endurance, patient endurance produces proven character, and proven character produces hope. This hope will not disappoint us, because God’s love has been poured out in our hearts through the Holy Spirit who was given to us. Wisdom that is greater than yours: If any of you lacks wisdom, he should ask God, who gives to all generously and without criticizing, and it will be given to him (James 1:5). Acknowledge there is strength that you need: I can do all things through Christ who strengthens me (Philippians 4:13). Insight from Scripture that will guide you: I gain understanding from Your precepts; therefore I hate every false way. Your word is a lamp for my feet and a light on my path (psalm 119:1-4-105). Trust in the goodness of Good: Let them thank the Lord for his steadfast love, for his wondrous works to the children of man! For he satisfies the longing soul, and the hungry soul he fills with good things (Psalm 107:8-9). Waiting is difficult when there is no obvious reason for the delay, and being patient can appear to be a waste of time when no purpose is in sight; however, when something better is promised, and hope is just beyond the horizon, waiting on God might be the best use of your time.